Almond oil is used also as a makeup remover. Switch from your common makeup remover to almond oil and use it on overall face or just in your eyes. It clears also the waterproof mascara. Just put some drops in a cotton swab and rub gently over your skin. It works wonders for under eye dark circles and reducing puffy eyes. Apply it daily before bed, this will help reducing them but also hydrating and preventing blemishes. Prevent and reverse signs of aging of your skin or eye area. It revitalizes and renews skin cells, moisturize and prevent crow’s feet or fine lines, making you look fresh and younger. Use it as a face scrub by mixing it with sugar. Exfoliating skin twice a week really helps to remove dead cells, impurities and gives a shiny and healthy look. This is a natural exfoliant that works well. Almond oil is also good in healing redness, inflammation, itching skin or other skin disorders. 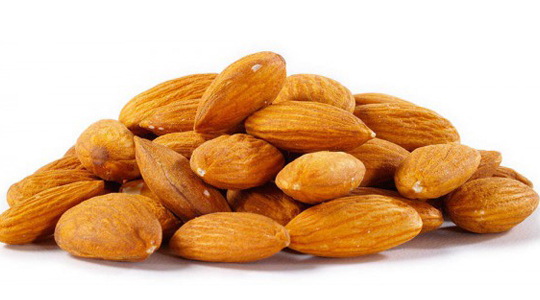 You can mix almond oil with 2 drops of vitamin E, chamomile oil and lavender oil to get rid of cracked skin. Give extra shine to your hair and condition them using sweet almond oil which keeps hair smooth and hydrated. Is better than your usual conditioner which contains silicone and chemicals. Just apply a small amount of oil using your fingers in the ends of your hair for a super hydration. Thanks to the mono unsaturated fatty acids found in almond oil, it moisturizes by penetrating deeply to the hair and makes them shiny, silky and bright. It also works as a hair protector or sealant. Make an oil massage to hair to stimulate hair growth and have a healthy scalp. Once a week use this mask mixing if you want with some essential oil drops, massage the scalp and then take a warm wet towel and wrap your hair. That helps the oil to get absorbed quickly. Another idea for reducing hair fall, split ends is to mix olive oil castor and almond oil in equal proportions. It is also helpful fighting dandruff problem. Mix almond oil with gooseberry and apply this mask to scalp. Wash your hair after 30 minutes. It’s perfect as a lip balm that highly moisturizes your lips. You can even make your homemade lip balm by mixing Vaseline, almond oil and few drops of essential oils. Give yourself a massage using almond oil and relief your stress. It’s more pleasant to get it warm before using which help to get stress away leaving your skin soft and relieved. Works well as a stretch marks treatment. Massaging problematic zones promote blood circulation, nourish the skin and make it more elastic. Ideal is after a bath so it penetrates better. Apply it every day for better results. As you see almond oil has so many health and beauty benefits if used daily. But be careful to choose a natural and trusted one, keep it in a dark and cool place.